Cabela's Arachnid Baitcasting Reel features a wide-aperture T-Wing System that reduces line angles and friction no matter where it is positioned during the cast. This innovative aperture allows line to flow freely while casting, and ensures even distribution of line across the spool width during each retrieve. 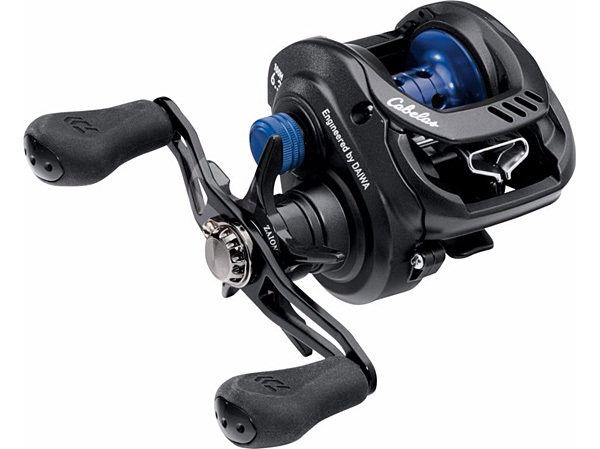 And, when combined with the Air Rotation System, which allows the spool to spin easily for longer casting distances, it results in one of the most precise and versatile reels on the market. 12-bearing system won't let you down, no matter how hard you fish. Ultimate Tournament drag gives you silky-smooth startups and the stopping power needed to rein in any hard-hitting fish that crosses your path. Plus it provides up to 13.2 lbs. of maximum drag pressure. Durable, corrosion-resistant Zaion star drag. Magforce®-Z Cast Control minimizes backlash while improving casting distance. Lightweight aluminum frame, spool and gear housing.